James Scott Bell is a former trial lawyer who now writes full time. He is also the fiction columnist for Writers Digest magazine and adjunct professor of writing at Pepperdine University. His book on writing, Plot and Structure is one of the most popular writing books available today. The national bestselling author of several novels of suspense, he grew up and still lives in Los Angeles, where he is at work on his next Buchanan thriller. On a wet Tuesday morning in December, Ernesto Bonilla, twenty-eight, shot his twenty-three-year-old wife, Alejandra, in the backyard of their West 45th Street home in South Los Angeles. As Alejandra lay bleeding to death, Ernesto drove their Ford Explorer to the westbound Century Freeway connector where it crossed over the Harbor Freeway and pulled to a stop on the shoulder. Bonilla stepped around the back of the SUV, ignoring the rain and the afternoon drivers on their way to LAX and the west side, placed the barrel of his .38 caliber pistol into his mouth, and fired. His body fell over the shoulder and plunged one hundred feet, hitting the roof of a Toyota Camry heading northbound on the harbor Freeway. The impact crushed the roof of the Camry. The driver, Jacqueline Dwyer, twenty-seven, an elementary schoolteacher from Reseda, died at the scene. This would have been simply another dark and strange coincidence, the sort of thing that shows up for a two-minute report on the local news--with live remote from the scene--and maybe gets a follow-up the next day. Eventually the story would go away, fading from the city's collective memory. But this story did not go away. Not for me. Because Jacqueline Dwyer was the woman I was going to marry. 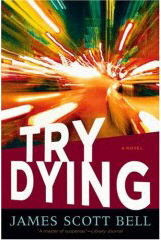 In Try Dying, this fast-paced thriller, lawyer Ty Buchanan must enter a world of evil to uncover the cause of his fiancee's death--even if hie has to kill for the truth. "Bell is one of the best writers out there...he creates characters readers care about...a story worth telling." wow, what tragedy- the loss of 3 lives. How interesting it would be to find out what, if any, good comes out of this incident.